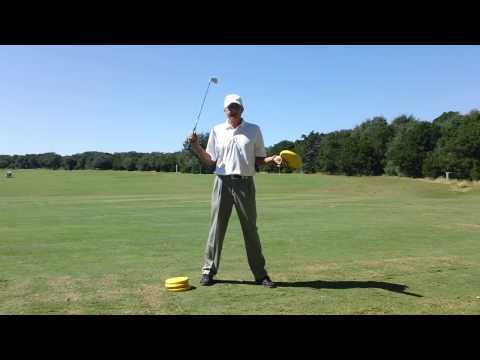 This is a great drill for the beginning golfer as well as the golfer that may be in a slight slump. Sometimes you just have to let go of all the mechanical thoughts and relate the swing to something we have all done. That "something" would be tossing a ball underhanded (using your dominate hand). The motion used for tossing is very similar to the golf swing as there is arm swing, body turn and weight shift. There are four parts to this drill. The first part of the drill is to toss a ball underhanded to a target about 20 yards in front of you. The ball should be tossed nice and high and come down soft. You can see how my weight is shifting to my left side prior to starting the downward motion of my right arm. At the finish, my weight is totally on my left leg and I am in balance as I face the target. The second part of the drill is to take your set up position and toss a ball underhanded to the same target as above. From the top of the backswing to the finish, the body must rotate so you can finish with all of your weight on the left leg as pictured. In the third part of the drill you will replace the ball in your dominate hand to a wedge. 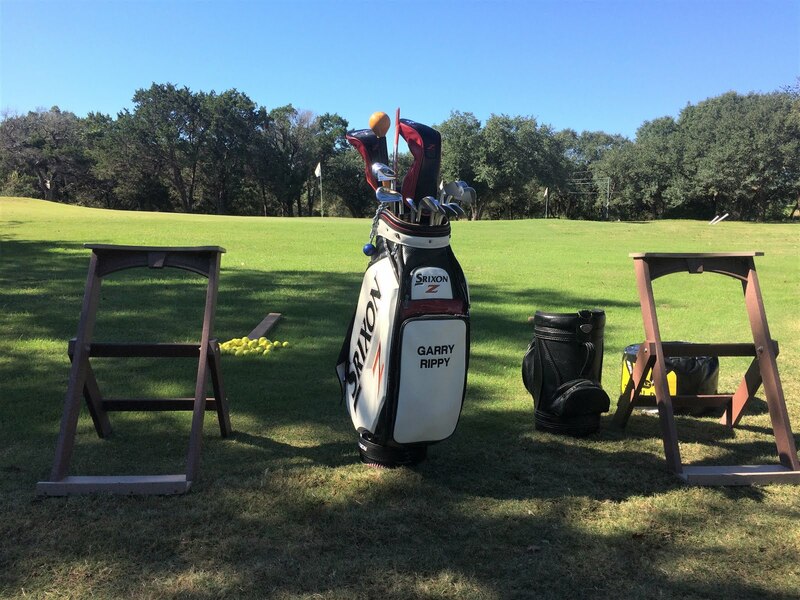 Before hitting a ball take numerous practice swings until you can finish in balance. Once you can accomplish this, tee up a ball and hit some shots with only the dominate hand on the club. Grip down on the club so it won't feel quite so heavy. The goal is the hit the ball about 30-50 yards depending on your coordination and strength level. You should "clip" the ball off the tee without a divot. The finish of your swing is the most important part of this drill. These two finishes would be incorrect and indicate more work is needed to finish in balance. Now you are ready for the fourth and last part of the drill. Using a wedge, hit balls as normal and see how your positions match up to the prior drills. Again, the finish is the most important part! In this portion of the drill you are trying to hit your shots about 75% of your full swing. In fact, for a better balanced finish, you are going to find a smooth swing makes it easier to accomplish. Look how the positions below match up to tossing the ball underhanded. I recommend spending about 30-45 minutes going through all four parts of the sequence. Before long you will begin to feel your swing develop as you focus more on rhythm and balance. Another benefit of this drill is you will learn to feel the correct hand action through the swing. This is a great drill to help you find "your" perfect backswing. This drill will help you establish more width and will help you find the proper length of backswing. Depending on your body build and flexibility, this drill will allow you to only go back as far as you comfortably can. One of the biggest issues I see is allowing the left arm to over bend on the backswing. This is usually due to tightness in the shoulders and what happens is left arm bends to allow you to make a bigger backswing. This over bending causes consistency issues! I would rather see a golfer with a more compact backswing which provides more control, than an overly long backswing which is difficult to time.